New Forest District Council: Darryl Howells of Pure Town Planning is pleased to announce another successful planning appeal overturning a Council’s refusal to grant planning consent. This time, planning permission was sought by Seventy One Design for the retrospective erection of a conservatory and boundary fence at Barton-on-Sea in Hampshire. 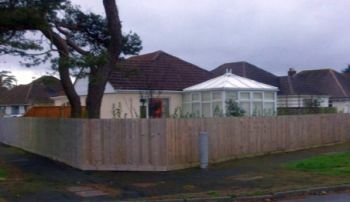 New Forest District Council refused the application on the grounds that the proposed conservatory would harm to the character and appearance of the area. Our clients were threatened with enforcement action by the Council but they instructed Pure Town Planning to appeal the decision. Following submission of our arguments, the Planning Inspector agreed that the scheme accorded with the general character of the area and would not conflict with Policy restrictions. A small win, but a win is a win…. If you have recently received a planning refusal notice and need some guidance then why not contact Pure Town Planning on 01202 585524 or email info@puretownplanning.co.uk for a FREE 30 minute confidential consultation.